Or maybe one does. What are your frozen delights of choice? Sorbets, frozen yoghurts, parfaits, semifreddos, etc, etc, are also eligible. 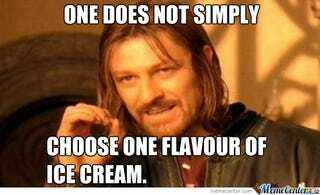 If you’re at the ice cream shop and ordering more than one scoop, what are your favourite combinations? And we’re not just talking artisanal hipster stuff, big chains count too. A housemate once introduced me to a raspberry sorbet made with just supermarket brand frozen raspberries, sugar and a dash of Chambord. I make it most summers. Sometimes I make a mint sugar, but I’m not convinced the mint makes all that much difference. When I go to my favourite ice cream shop, I like to get a scoop of coconut ice cream and a scoop of lime sorbet.